The RiLL AQUA 500 is the small brother to the RiLL Aqua 1000. Like its bigger brother it comes with retro style as standard and a colour palate straight from the 1980’s. Beating at the heart of the RiLL Aqua 500, is a bright high power green and blue laser system, giving very realistic argon based colours. 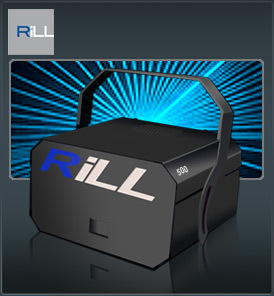 Couple this with the PM2000 laser software and you have an impressive entry level old skool performer with tunnels, waves, and grid laser effects, The Rill Aqua 500 The ultimate entry level Old Skool performer. The PM2000 additionally has support for traditional laser display oscillator type effects. The oscillation engine is very advanced when compared to "stand alone" desks of the 80's. Using the calculation power of the PC's internal processor - An unlimited number of effects can easily be obtained using the oscillators.